The Orange County Great Park in Irvine, California bills itself as “the first great metropolitan park of the 21st century,” but until recently it was the Marine Corps Air Station El Toro. The base was commissioned in 1943 and served as an airport for President Richard Nixon as he shuttled between the Western White House and Washington, D.C. After El Toro was decommissioned in 1999, the site was dormant for years. Then, after a long and contentious debate, voters approved a plan to create the Great Park. 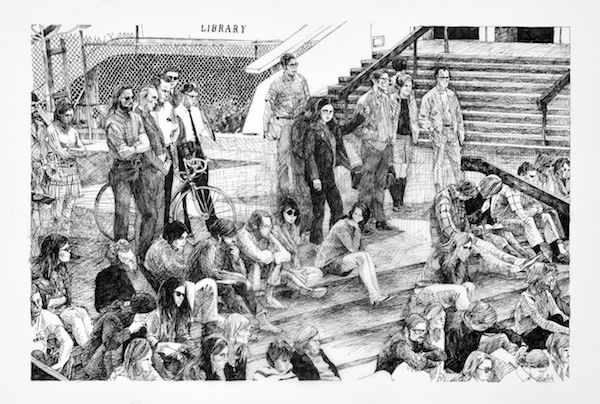 In 2011, I was invited to be one of the park’s first artists-in-residence. At the time, I was fascinated with what psychologists call “mental time travel”—the way old family photos or home movies can reanimate an emotion and cause you to re-experience physical sensations you felt at the time. It can also happen with historical events. 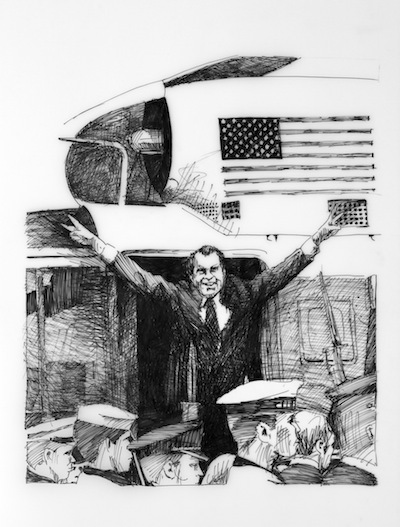 Images of President Nixon’s resignation trigger a rush of feelings in me—even though I experienced the event as a 10-year-old watching it on television. 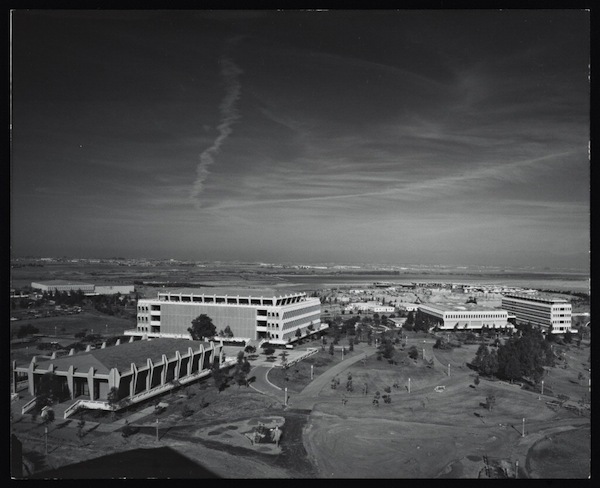 The layout of the UC Irvine campus and an adjacent community planned for 50,000 residents was designed by William Pereira, the architect who drafted the master plan for LAX. In photographs that ran in the September 6, 1963 issue of Time magazine, a dashing Pereira gestures to his blueprint of subdivisions and cul-de-sacs—“the perfect place to live, work, shop, play, and learn,” as described by Irvine Company literature. University of California, Irvine, First Increment (Irvine, Calif.), 1968, Julius Shulman. Getty Research Institute. A sleeve of 35mm slides from October 4, 1965, opening day of the University of California, Irvine reveals many buildings still under construction, and bare ground dotted with fragile saplings staked to posts. 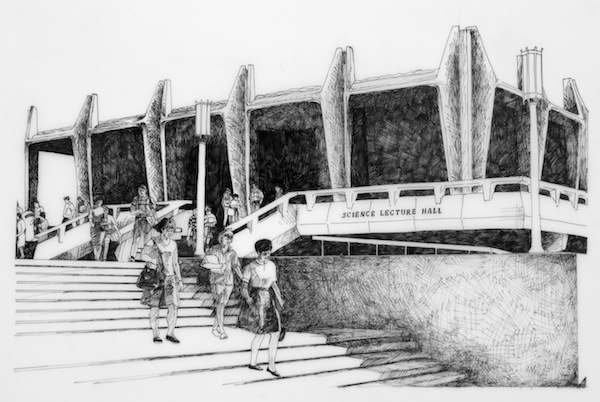 Smiling girls with bouffant hairdos and boys with crew cuts carry armloads of books through William Pereira’s vision of the perfect future—all space age cement curves and expressionistic patterned facades. I don’t think the protestors know it yet—the 24-hour news cycle hadn’t been invented— but National Guardsmen in Ohio opened fire on an unarmed crowd at Kent State University at 12:24 p.m. that same day, killing four students and injuring nine. Based on the angle of the sun and shadows on the plaza, the massacre in Ohio has already happened. It’s a weird feeling to know this has happened when the students in the photo do not yet know. Deborah Aschheim is an artist who makes installations, drawings, and sculptures as part of a long-term investigation of personal and collective memory. Her project, “Involuntary Memories,” will be exhibited at the Richard Nixon Presidential Library and Museum from July 26 to September 28, 2014. 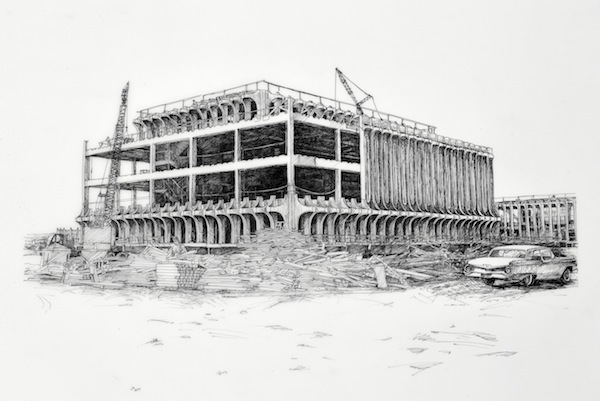 *Drawings by Deborah Aschheim. 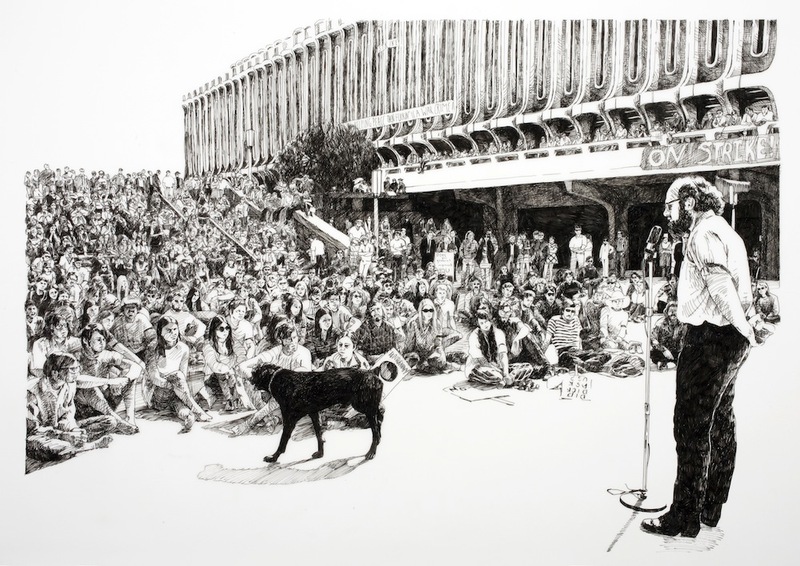 Lead image: May 4, 1970 (Irvine), 2012, Ink on Duralar, 35” x 42”. Photo by Julius Shulman, courtesy of the Getty Research Institute.